Karl-Heinz Krahl was born on 25 September 1914 at Breslau. He joined the German army pre-World War 2 but later transferred to the Luftwaffe and underwent flying training. Krahl served in the Spanish Civil War with the Condor Legion as a bomber pilot. He was awarded the Spanienkreuz in Gold mit Schwerten for his service there. On his return to Germany, Krahl re-trained as a fighter pilot. At the outbreak of World War 2, Krahl was serving with JG 2. Oberleutnant Krahl was assigned to the Stabsstaffel of I./JG 2. He later became Staffelkapitän of 1./JG 2. He recorded his first victory on 21 April 1940, when he shot down a French Morane fighter near Saarbrücken. Krahl was appointed Staffelkapitän of 3./JG 2, based at Mardyck in Belgium, on 5 September 1940. He led the unit during the Battle of Britain gaining 10 further victories. Krahl recorded his 10th victory on 28 September, when he shot down a RAF Hurricane fighter. 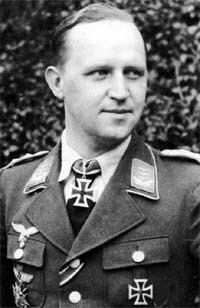 On 20 October 1940, Krahl was promoted to the rank of Hauptmann and appointed Gruppenkommandeur of I./JG 2. On 13 November 1940, he was awarded the Ritterkreuz for 15 victories. During 1941, he was to claim four victories over the Channel front, including three victories on 24 July to record his 16th through 18th victories. On 21 November 1941, Krahl was appointed Gruppenkommandeur of II./JG 3 and led it to the Mediterranean theatre on 18 January 1942. Based at Comiso on Sicily, operations over Malta were undertaken. He recorded his 19th, and last, victory on 10 March, a RAF Hurricane fighter shot down over the island. On 14 April 1942, Krahl was making a low level attack on Luqa airfield on the island of Malta, flying Bf 109 F-4 (W.Nr. 8784) “<<”, when he was shot down and killed by the island’s anti-aircraft defences. Karl-Heinz Krahl claimed 19 enemy aircraft shot down. All his victories were recorded over the Western front.